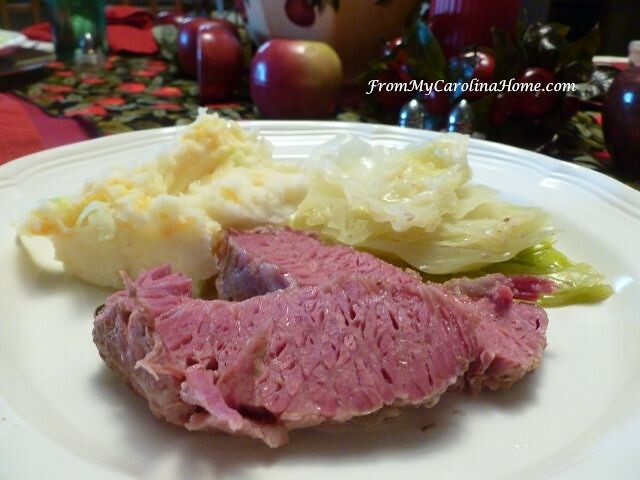 Is there anything that says Irish holiday more than corned beef? Well, maybe Irish Stew. But given a choice, I’ll take a wonderful, tender, corned beef roast any day. 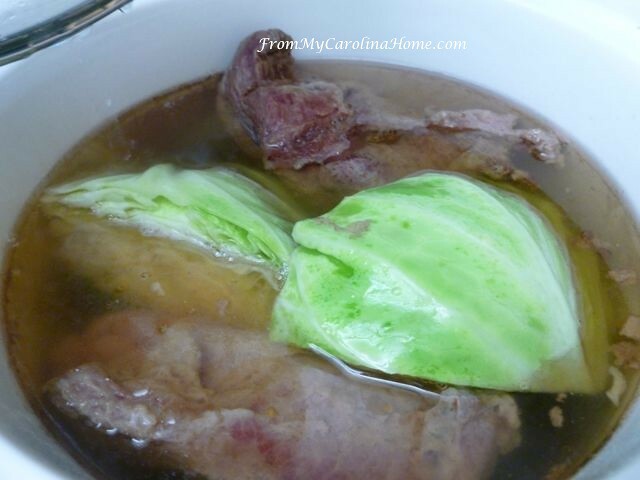 The moist meat has a flavor unlike any other, perfect with cabbage and potatoes. Wonderful for dinner, and great the next day too, it is a hearty meal for a cold day in March whether you celebrate St Patrick’s day or not. These are really so easy to get tender and flavorful with the way the meat comes at the store. Prepackaged with the spice packet, you just open and assemble, set the slow cooker and forget about it all day. 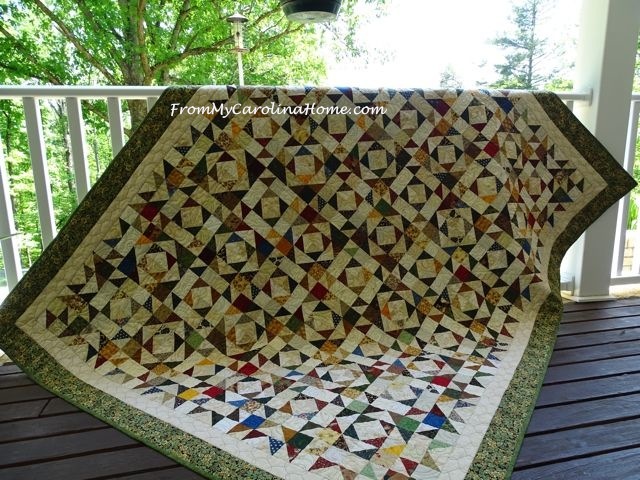 Sew and quilt, stamp and garden all day, and then dinner is ready. 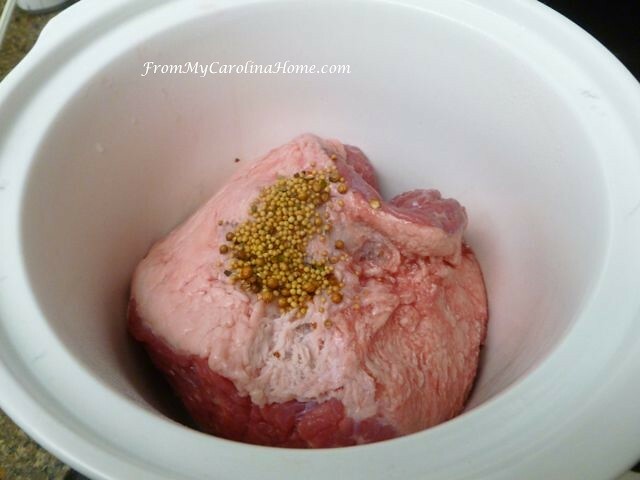 I use a 4-quart slow cooker for a 2-3 pound corned beef roast. Following the directions on the package, place the roast in the cooker, sprinkle on the seasonings packet, add a bit of water and put the lid on. I start on high for one hour, then turn to low for 6-7 hours. If you wanted to, you could add some potatoes to the slow cooker too, the little red skin ones do well for long slow cooking. About 20-30 minutes before the dinner will be served, cut a cabbage into quarters and add to the cooker. I used half a cabbage in this meal. When ready, remove from the cooker and let rest on a platter covered with foil for 20 minutes or so. If you didn’t use red skin potatoes, make my Cheddar Onion Mashed Potatoes while the roast rests. 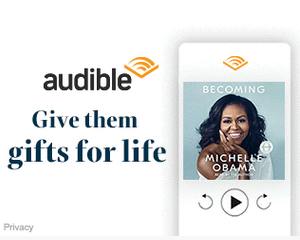 They go really well with lots of entrees. Slice across the grain into thick slices. Yum, hot and delicious, and so easy. DH prefers cole slaw to cooked cabbage, so I chop the other half of the cabbage and add dressing for his meal. There is usually enough for the next day as well. Perfect for next weekend for St Patrick’s Day, or really any day where you want a hot and hearty meal. 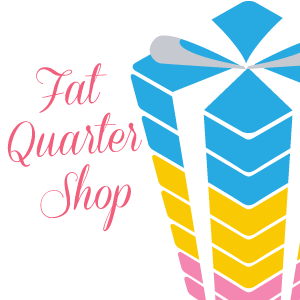 It is likely that they will be on sale this week too. Marvelous the next day too, a warm corned beef sandwich on Sourdough bread. Or rye if you prefer that, or really whatever bread you like. If you are not a fan of corned beef, try my Cabbage Rolls with Brown Sauce, also hearty for a cold day. 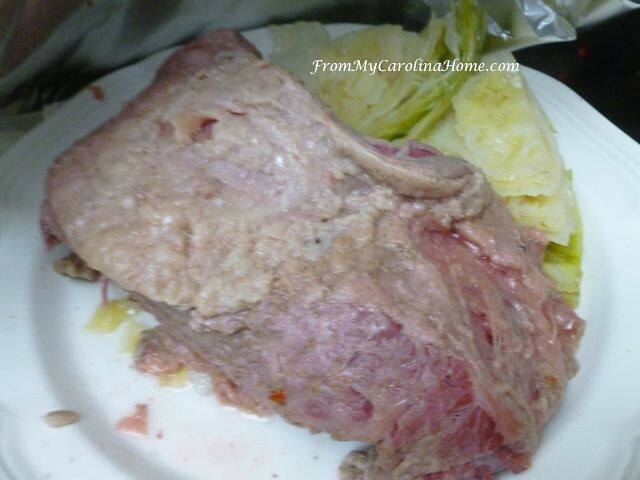 Do you like corned beef? 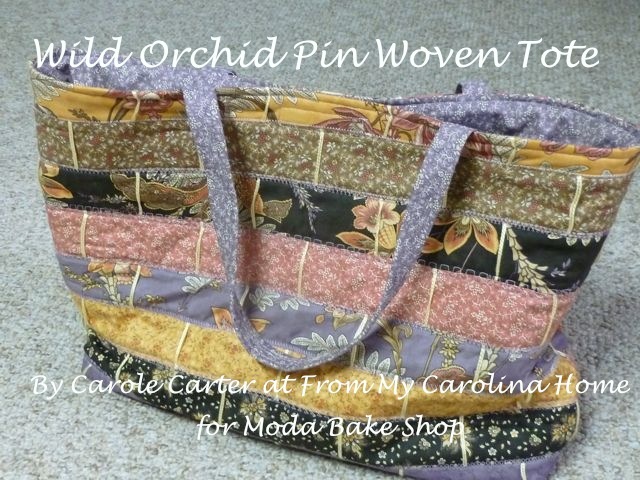 Have you made one before? PS I ordered a new slow cooker, more why I needed a new one, and why I chose this one later. 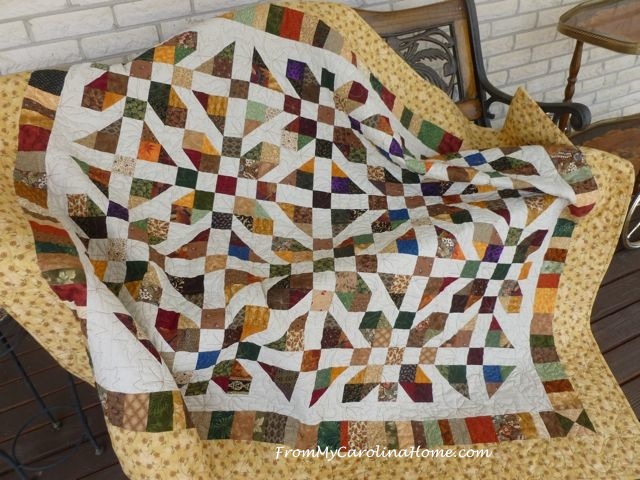 But here is my new one on the way! KitchenAid Slow Cooker. Mmm! We love it many times over the year! Thanks for the hints and tips! That looks delicious! I haven’t made corned beef before but I have made salt beef which I really must do again. Here in the UK, corned beef has a slightly dodgy reputation as cheap meat from tins, a far cry from this! Yay! All these 45 married years, I’ve never made corned beef, just bought it @ a fabulous butcher for pastrami or corned beef sandwiches. Looking fwd to trying this – sure sounds easy enough! My family loves corned beef and Irish soda bread. This year I’m going to try making calcannon potatoes. Hello Carole; Boy am I the odd one, I do not like Corned Beef. LOL. 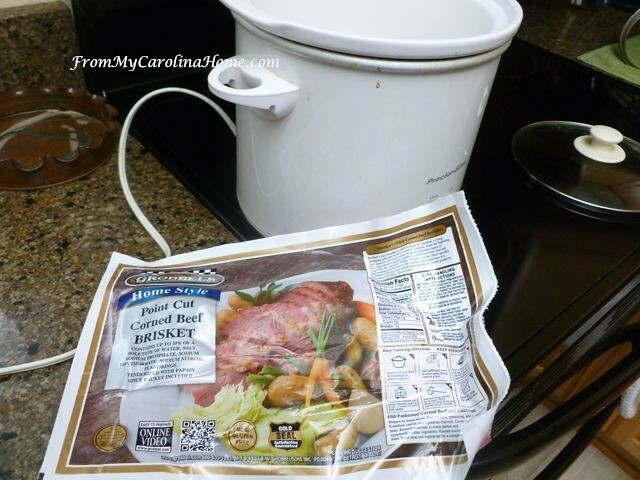 Hubby and I do however, love to cook our beef roast in the slow cooker. It does turn out so tender and delicious! After reading your post and the comments, I am going to have to look at or up some of the recipes mentioned and try them. I sure hope that you have a great day! 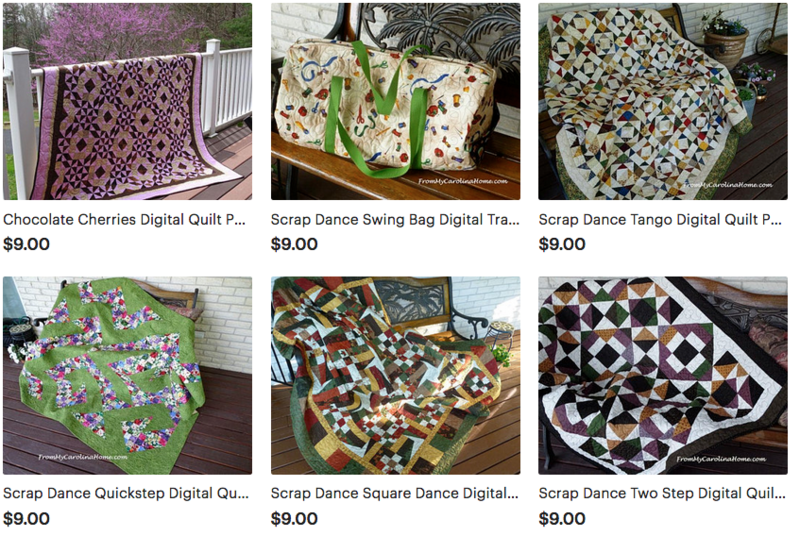 I am off to work on my 9 patches! 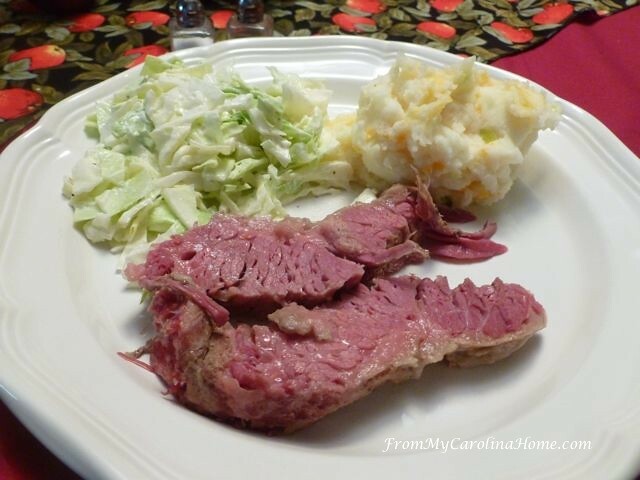 We love corned beef and I always cook it in the crock pot too 🙂 Hubby’s birthday is the 16th of March so we usually fix it that day and then have sandwiches on St. Patty’s Day . 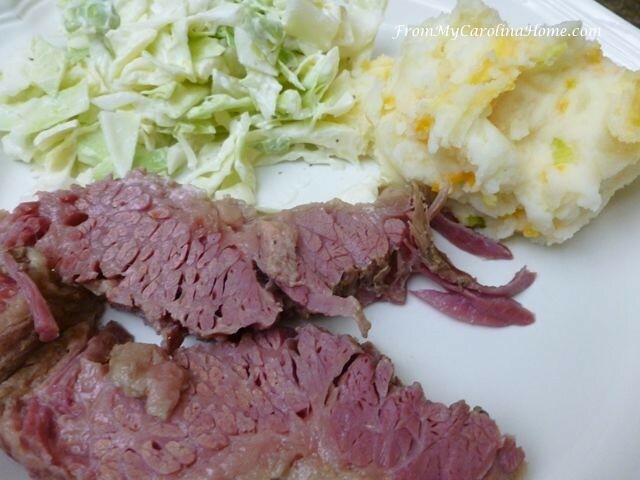 John cooks two meals a year, and corned beef on St. Patrick’s Day is one of them. He does it much like you do. Yummy! I love corned beef and cabbage. I am planning to fix one in my Instant Pot this week. Do you ever do any Instant Pot recipes? I am trying to come up with several recipes for mine without buying a cookbook. 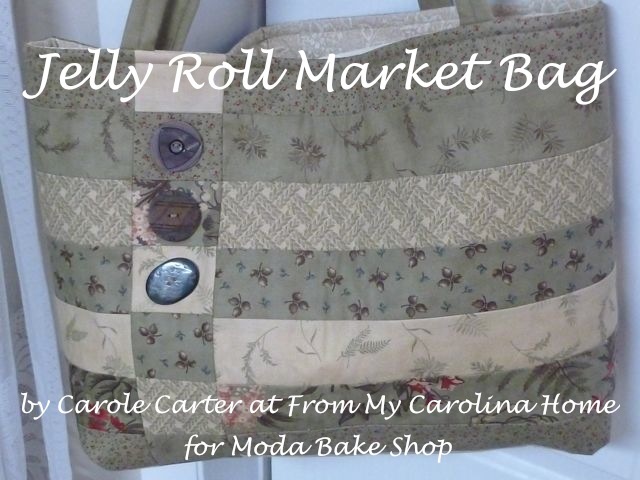 Oh, Carole! I LOVE corned beef and cabbage. I add carrots and potatoes as well. I hope to find one on sale next time I go grocery shopping. I love corned beef. Apparently my mil. used to make a beautiful onion and white sauce with it. I have not been able to find an easy recipe for it. (She can’t remember how to do it.) when I have tried I can taste the flour… I’ll keep looking. 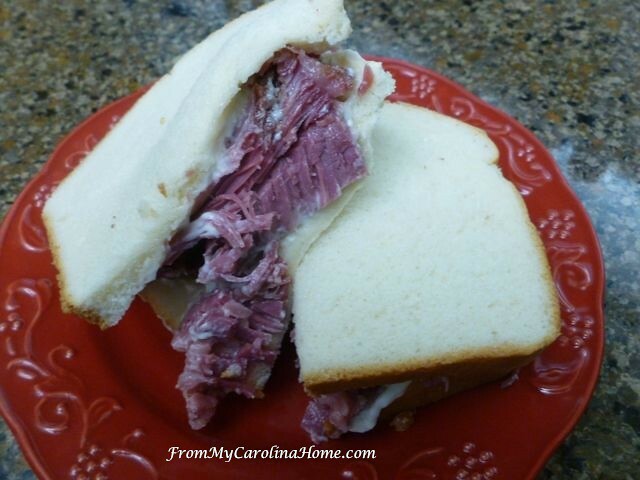 I am new to my Instant Pot and was wondering how long to cook my corned beef in it. Any ideas? Might as well get all the info — how long will you cook the potatoes, cabbage, and carrots in the remaining liquid? Don’t like it, but my kids do… I think it’s the corned part I don’t like! I’ve done it without the spices before… but I do love cooked cabbage. It’s an oklahoma thing maybe… mom used to swim it: bacon and some water. I tend to frizzle it: bacon and onion until onion is soft, then add cabbage cut in chunks and cover and let it cook down. 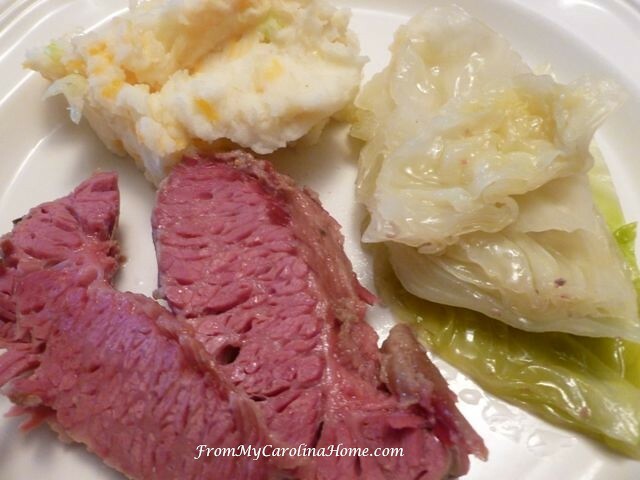 Corned beef never Irish, created in America when Irish immigrants borrowed from their Jewish neighbors…. Okay, now I’m hungry Some champ or bubble and squeak maybe! Hi Carole! 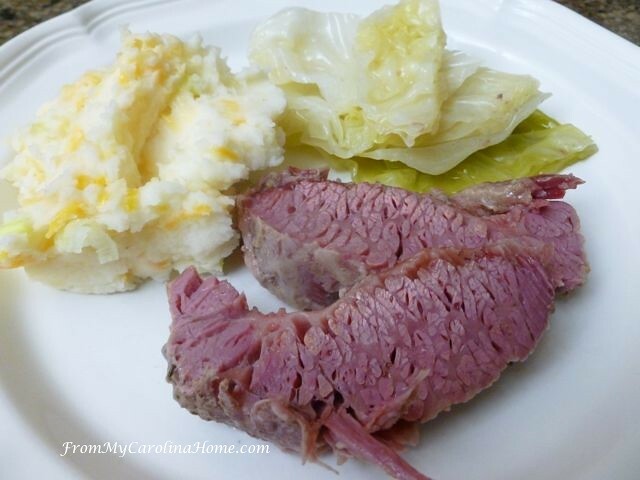 I agree, this is one of the best and easiest ways to make a corned beef! Believe me, with my last name I’ve tried just about every way possible! lol! Love the fact that they put it on sale this time of year. always buy extras and fill the freezer! Enjoy your Holiday and that fantastic meal!! I love it! I don’t make it, though. Paul used to make it with cabbage and potatoes for me at least twice a year, sometimes more. I miss his cooking a lot! Yours looks scrumptious.